These are very easy to make and can be filled with any ingredients. They are extremely kid friendly and would be great for a birthday party. Let them add their own toppings and depending on the age of the child, have an adult finish the calzone or allow them to seal the edges. They can also be made into triangles by cutting a square and fold diagonally to form a triangle. The ingredient amounts will make 2 calzones. Double or triple for serving a larger crowd. Roll out dough to seal any tears. Using a bowl, cut around it to form a circle about 6 inches in diameter. Cut a second one too. 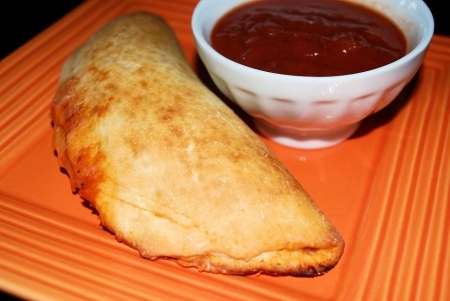 Add marinara sauce and cheese or any other ingredient desired to each calzone. Try to center ingredients, so that when folded they won’t seep out. However, some may and that is fine. Take one side of the calzone and fold it to the other side and seal the edges. Repeat for the second calzone. For triangles cut dough in half. It will be the shape of a square. And add ingredient to each square and take one side and fold over diagonally to create the triangle. Repeat with the second calzone. Place on a pizza baking stone sprinkled with Semolina flour, cornmeal or all-purpose flour. Alternatively, place on baking sheet sprinkled with Semolina flour, cornmeal or all-purpose flour. Bake in a preheated oven at 400 degrees for about 15 minutes. Let cool slightly serve with marinara sauce for dipping and enjoy!